It's the beginning of the year and the perfect time to decide how you're going to plan your training and racing for 2019. Last year at this time we covered the basics of periodized training and how you can plan your entire calendar year in order to put in your fastest possible performance. In this post we're taking a close look at "reverse periodization", which is a similar — but better suited to make use of the short and cold days of winter. This approach also may make you faster, as it does for many enthusiast and professional endurance athletes. You're likely familiar with the principles behind "traditional linear periodized training", where you start out with weeks or months of long workouts in zone 2 in an effort to slowly build up your base endurance. However, it can be difficult to fit so many lengthy workouts into a busy schedule (it isn't easy to fit in 4 hours on a bike trainer before work in the morning). Plus, harsh winter weather and limited daylight make it difficult to stick to a plan. Reverse periodization moves shorter, more intense workouts to the first stages of training, which can be easier to fit into your winter calendar. Don't think of reverse periodization as a radical rebuke of linear periodization, because they are not that different. Done correctly, both models target specific adaptations over time and focus on providing race-like workouts the closer you get a race. They also don't act as singular training plans, but rather as broad strategies that take entire seasons into account. The main difference with reverse periodization is that instead of starting out with a "base phase", you jump right into the "build phase" with low volume, high intensity workouts that target your thresholds. For this reason, reverse periodization isn't the best choice for people who are just starting out in endurance sports, or for people who are completely out of shape. Without the slow ramp-up of fitness that you get with linear periodization, there's a greater chance for injury in the first phase of training. Base training comes later in reverse periodization, which lowers the chance injury closer to race day. It's important to note that there aren't strict divisions between these approaches to training. A coach or a self-coached athlete will often include threshold workouts during the base phase of a linear periodized plan. The same holds true of reverse plans. As shown in the chart above, the race phase of training tends to be pretty similar between the two, with more recovery and a decreasing amount of training as race day approaches. Creating an effective reverse periodization plan isn't as simple as reorganizing the phases of a structured linear periodization plan. There's a lot more nuance, and the workouts you plan will vary greatly depending on the sport, the duration, and the date of the "A race" you want your fitness to peak for. This kind of training is definitely not "one size fits all". 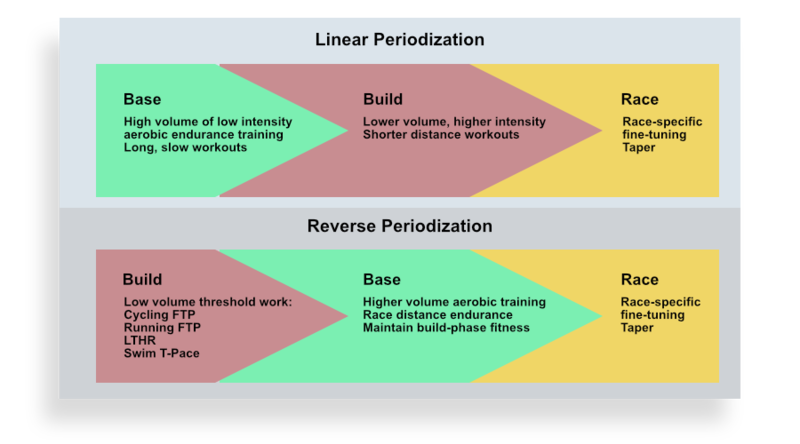 If you're an experienced self-coached athlete who has created and executed linear periodized plans in the past, you should consider giving reversed periodization a try. You may have reached the limit of what a linear plan can provide, and that a reverse plan can help you break through a plateau and reach new heights. The first phase of training in reverse periodization isn't just about working to improve your thresholds. This is the time to work on improving upon your weaknesses from the previous season. As you move into the base phase, you will continue with some higher zone workouts while increasing volume until you are closer to race-like distances and durations. If you're not an experienced self-coached athlete, this is an area where seeking the advice of an expert will pay off in a big way. Keep in mind that every athlete responds differently to stimulus. What works well for one person can be much less effective for the next person, and so on. Some experimentation will likely be necessary to find the training model that works best for you. In Australia, summer has just begun. There is more daylight and warm air, so doing lots of low intensity, time-consumptive base aerobic work is more amenable, especially for outdoor cycling. In the northern hemisphere it's the opposite. If you live in the top half of the planet and follow reverse periodization, your longer endurance workouts will arrive with the warm air and extended daylight of spring.